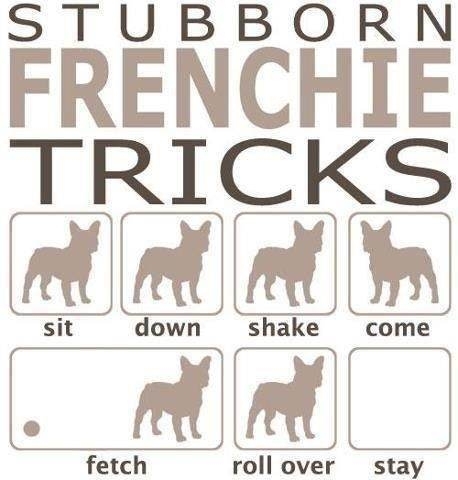 Trick 1#: Love Your Frenchie.. They Love You. For Puppies: Make sure you spend lots of time bonding with your new pup! Should you decide to get a dog from far away, our recommendation is that you road trip and use the car time for bonding. Food: We feed our puppies a combination of Bil-Jac frozen dog food with a small bite version of puppy chiot. Since we have an unlimited supply of eggs from our chickens, we also feed plain cooked egg to our pups over 12 weeks. Water: Frenchies tend to need LOTS of water for their spurts of energy, so make sure to provide clean water each day. Crate training: We use this method with our dogs, if we are gone for more than 10 minutes. When puppies are little, the lack the bladder control to go all day without a break, so we try to make sure they get a potty break every couple of hours until they develop better control. Also, we hope that the crate provides a sense of security, so put in a blanket or clothing with your scent, and a non-rawhide chew toy/bone. For young puppies, a clock or other mechanism that makes a ticking sound can offer reassurance (like mama's heartbeat) during the first few weeks in their new home. Healthcare: We have been fortunate and intentional in that our Frenchies are hearty, with few health concerns. However, this breed can have difficulty with health problems due to the shortened snout, associated with hips, and vision concerns. Please make sure that your Frenchie is in a temperature-controlled environment to account for their tendency to overheat. Grooming: Besides the typical maintenance, Frenchies require cleaning between the folds of their skin around their eyes. Consult with your veterinarian about the recommended tool for this--we use Hydrogen Peroxide and a Q-Tip for precision. Frenchies can develop yeast infections here, as well as in-between their paws, if left unattended. Training: This breed is every bit of a bulldog--independent, yet loyal; stubborn, yet eager for attention and play. We use food as a motivator, along with lots of verbal praise and physical affection. Disposition of both dog and owner, along with consistency accounts for the effectiveness of the training. That said, there is some truth to this image.